UPDATE from the Junior League! Due to the state of the emergency the Governor has called and for the safety of our event attendees, we are moving many elements of the Inaugural Ball to tonight to coincide with the already planned Council of State reception at Marbles Museum. We are in the midst of coordinating the exact plans for this evening and contacting all honorees, ticket holders, sponsors, vendors, volunteers and members. We are also coordinating with the Governor's Office. If you have a ticket for Saturday night's events, starting at 6 p.m., you are welcome to join us at Marbles for tonight's festivities. Tonight's attire is black-tie optional. We will have a cap on the number of attendees that Marbles can hold, so attendees will be on a first come, first served basis. As you can imagine, we've been poring over our options this week for our events. We found four: Continue as planned, cancel, shift plans to tonight or reschedule altogether. Unfortunately after considering the logistics, requirements and manpower involved in hosting an event for more than 3,000 people, rescheduling isn't a viable option. This planned celebration of North Carolina is two years in the making, involving countless vendors, community members and volunteers. That left us with consolidating the events as our best option. Can't make it to the ball? Watch our special on Sunday at 7 p.m.! 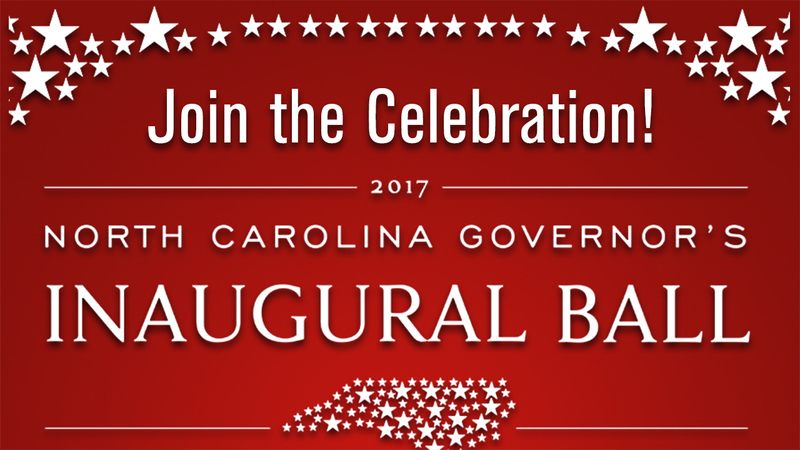 ABC11 Eyewitness News is giving you an exclusive, front row seat to the 2017 North Carolina Governor's Inaugural Celebration. You can get an inside look as we start this New Year with new governor Roy Cooper. You'll see it all! From the first oath... to the last dance. Be an eyewitness to history. Watch the ABC11 North Carolina Governor's Inaugural Special - hosted by Joel Brown and Anna Laurel. This Sunday, January 8th at 7:00pm only on ABC11 Eyewitness News.